The criterium was held on Sunday, 2nd December 2012 and the individual time trial was on Sunday 9th December 2012. This is the 3rd time Ali and me join the criterium and the 1st for Zaeidi. 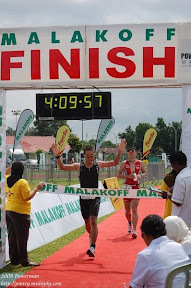 The race was held at the new housing area Kg Lumut. It is a very low traffic area and totally flat road. Usually, the criterium is held on Friday afternoon but for this last criterium for the year 2012, it was held on Sunday morning. If I’m not mistaken, around 20 cyclists showed up. 3km per lap (15 laps). There is no sprint point in between the lap, just the final lap. Ali finishing 1st place. Well done. Last time around July, he got 3rd place. This is the 1st individual time trial held by Geotrax. The distance was 28km of flat road. 18 cyclists showed up. 2 Elite and 16 novice. Zaeidi was 7th and I was 8th on the starting list. I only managed to catch 2 riders. For this time trial, Zaeidi got 1st place and I got 4th place. It is a good experience for newcomers and beginners to try out small races like this before trying out the big races and for other cyclists, it is good for them to participate to keep check their performance and techniques. Well done and thank you to GeoTrax for organizing these races and hopefully more races to come in 2013. As a cyclists, all of us should support people like Pehin Yahya, Geotrax, LOF bakery, TelBru and others because without them, we might not have many cycling races in Brunei. Also not to forget, Brunei Darussalam Cycling Federation (BDCF), who provides the support either directly or indirectly to these races.